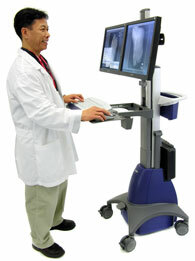 Enhance your imaging implementation by providing comfortable access to patient data and images. 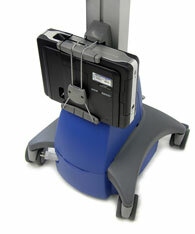 The StyleView’s power syatem lets you go truly mobile, getting to the point-of-care unhindered by cords and cables. StyleView’s open architecture provides the flexibility needed for future hardware upgrades. The result: improved staff comfort, efficiency, accuracy and lower total cost of ownership. 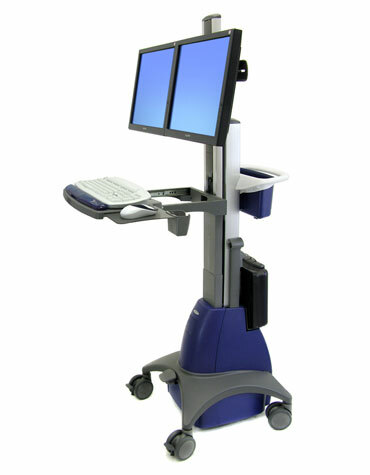 Includes: Retractable cord reel, 3 hospital-grade AC outlets, remote user interface (RUI), StyleLink software, CPU holder, scanner holder, full-size keyboard tray, left/right mouse tray, wrist rest, mouse pouch, cable management, riser lock, four dual casters, rear handle, storage basket . Weight Capacity, LCD: 17 lbs (7.7 kg) per pivot. 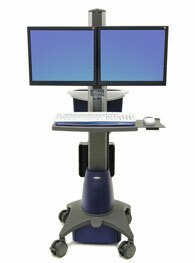 Weight capacity may be diminished if monitor depth is greater than 2 inches. 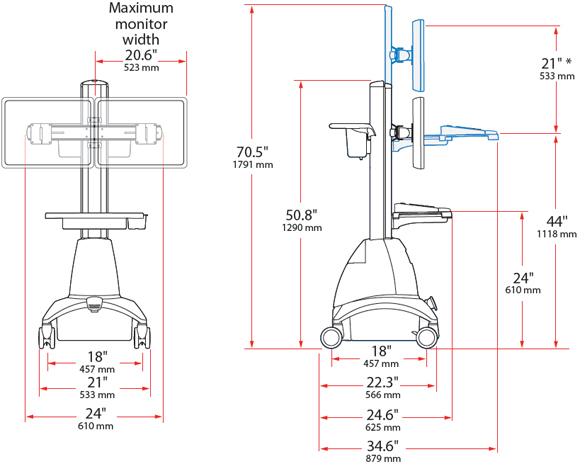 Certification: The cart is certified to UL standard 60601-1. This listing also includes certification to CAN/CSA STD C22.2 No.601-1M90. Warranty: Five (5) years on lift mechanism and structural components. Warranty: Two (2) year on power system, 90 days on battery performance, six (6) months on battery against manufacturer’s defects. Enhances space in imaging environments. Power system comes standard with a two-year warranty—the best in the industry. Cart is certified to UL 60601-1. 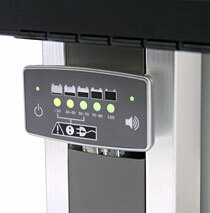 Remote User Interface (RUI) located at eye-level alerts user when battery-charge is low. Automatic Transfer Switch (ATS) allows on-the-go recharging, resulting in uninterrupted use—no need to shut down the computer. Three hospital-grade AC outlets allow hardware selection flexibility. 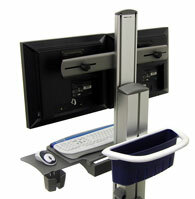 20-inch height adjustment for comfortable data entry sitting or standing. CF™ motion technology provides fluid, one-touch height adjustment. High-performance casters for easy movement on all types of floor surfaces. Accessories available to enhance workflow productivity.